Due to increased needs in prioritizing my time elsewhere, I've been cutting down on the blog posts. This entry was posted in Uncategorized on April 20, 2017 by Kai. The company we founded together with Jonas Nyberg in 2015 is featured in this years batch at the business accelerator Startup Sauna. Only 2% of the applicants were accepted, so this is great news 🙂 In the near future, I'll be focusing 100% on the business side of things over at Noiseless Acoustics, which means that there might be a slight gap between this post and the next one. Stay tuned. This entry was posted in Entrepreneurship on April 23, 2016 by Kai. Instead of just examining things related to room modes myself, I thought it would be cool to make a tool available for everyone. Only in 2D for now. Please report any bugs directly to me! In this post, I'm examining the low frequency response of my living room. I'm going to compare it to a theoretical model obtained using FEM and see how much useful information FEM gives me. My living room has two open doorways without a door, which means that the geometry will usually be like the one to the left (with all other doors closed). I was really curious as to what the effect of the two "chambers" (the entryway and the kitchen) have on the response of the room. I divided the model into tetrahedrons using MeshPy, resulting in the figure you can see above. The mesh is quite coarse, but dense enough for the purpose. In addition, I used linear elements. The room modes took about a second to calculate once the mesh was done (with the meshing only taking a few seconds), which I found impressive. I added a tiny amount of damping to the system and assumed that the boundaries were perfectly rigid. I recorded the signal in the middle of the room and applied the popular exponential sine sweep technique by Farina. The rigid assumption resulted in the resonant response being slightly "higher up" as compared to the measured one. Still, I find the correlation between the responses below 100 Hz fantastic. Apparently there are some details above 100 Hz which should be taken into account (probably furniture, and also less damping), but below 100 Hz there are a lot of similarities. Additionally, I'm thinking that the mesh with linear elements might not be dense enough for over 100 Hz. The speaker I used has a poor response below 50 Hz, so the sharp peaks there were regrettably not visible in the measurement. Note that I wasn't really measuring the response at 170 dB 🙂 . I tried a few different techniques to visualize the modes, and found it surprisingly difficult to get a nice looking result. Using iso surfaces in mayavi resulted in a result I think looks decent. 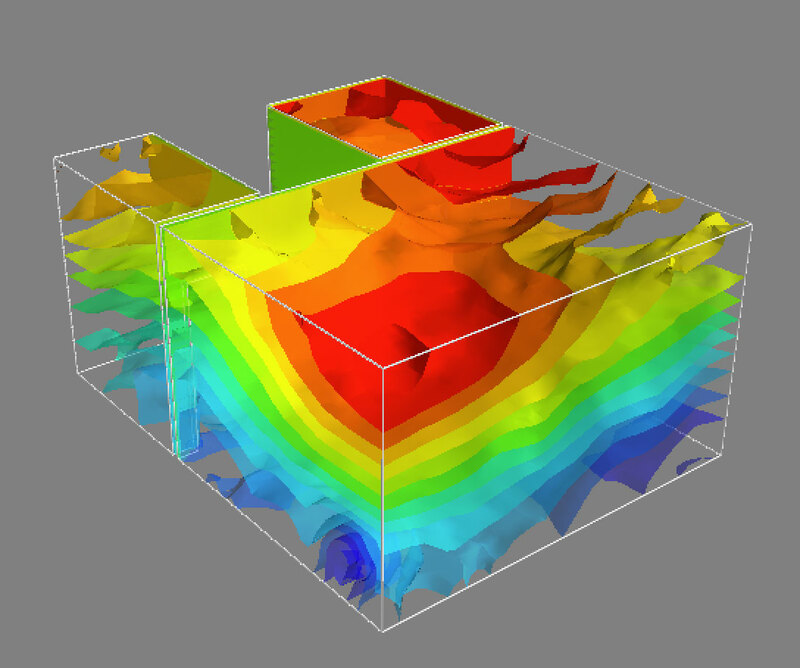 Here's the mode representing the peak you can see at about 50 Hz, with the surfaces showing constant pressure values. As you can see, the whole room is actively participating in the mode. Another interesting mode is the lowest mode at ~20 Hz. It's far lower than one would estimate using just the rectangular part of the room (37 Hz). It's fascinating how the gradient of the pressure field goes from one chamber to the other. The living room seems to be a prime example of a room where FEM gives very nice results. I would argue that there would be absolutely no point in trying to deduce the lowest modes from the rectangular dimensions of the room, when the real room modes are so specific to the whole geometry. This analysis is also really quick to do, so it doesn't add that much extra time to a project. 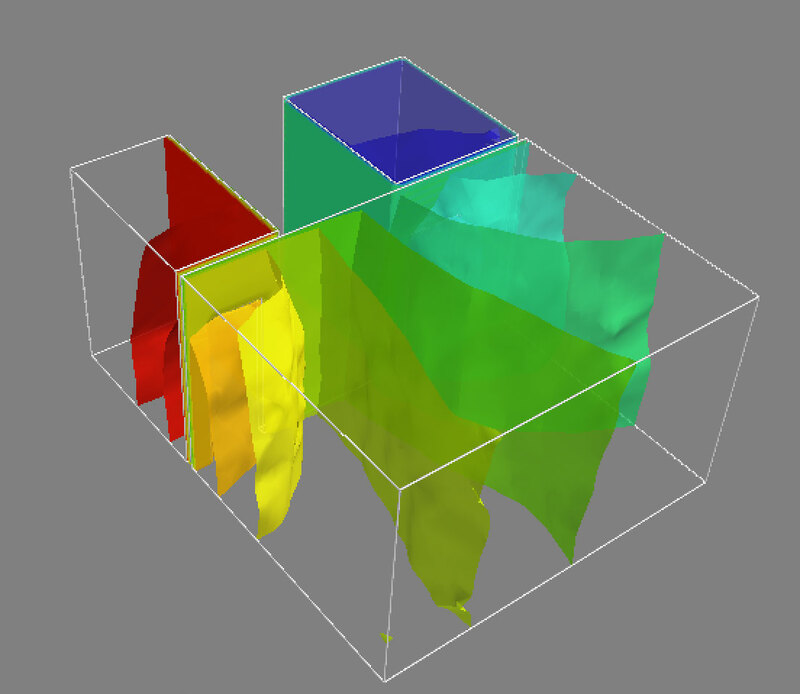 This entry was posted in Acoustics, Finite element analysis, Python on January 31, 2016 by Kai.